The Ninjago theme was introduced in 2011 and now contains over 250 LEGO sets. The extremely popular theme is based on the Ninjago: Masters of Spinjitzu TV series, which has aired for over nine regular seasons. Interestingly, LEGO have not included every character from the TV series. 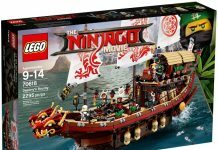 Due to the popularity of the series and sets, there has been a number of books, magazines, video games released and also the spin-off LEGO Ninjago movie in September 2017. Find the top 10 best Ninjago sets here. Fun facts: Kai is the only Ninja to get an episode solely focused on in him in every season. Also, did you know that Nya’s name was originally going to be Aya! ?